Another post here recently tackled the question of why strategy is such an unpleasant topic for many SMBs. 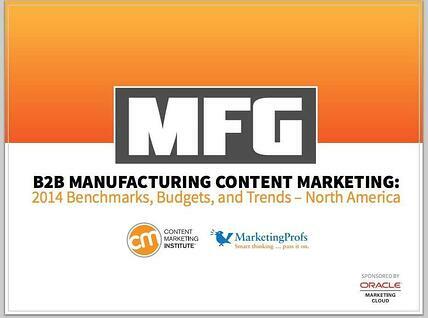 And then along came the Content Marketing Institute's 2014 report on B2B Manufacturing content marketing. And what do you suppose it showed? Some shocking statistics around that nasty strategy topic. Imagine that...11% of all B2B manufacturing companies DON'T EVEN KNOW IF THEY HAVE A CONTENT MARKETING STRATEGY!!!! 68% are deliberately flying blind. 11% don't have a clue. 21% claim to have it figured out. And absent strategy, the average B2B manufacturing marketer is simultaneously thrashing around with an average of 13 different content marketing tactics, while 70% are producing more content than they did last year. So stepping back, one can deduce that, assuming all 21% with a strategy are among the 70% producing more content, 49% are producing content without direction that guides its focus, creation, execution and results. Who in the world is bankrolling this? Who'se writing the checks without regard for the plan and ROI? Although it's not specifically reported, one can further assume that these companies are rocking their sales quotas. Instead of specific goals around sales qualified leads and revenue, the top goal of these elite B2B manufacturing marketers is...drum roll please....brand awareness. Seriously? And people wonder why CFOs are skeptical of any investment in marketing? But it get's deeper. The primary metric they cite to measure their success? Website traffic. Not an entirely irrelevant number in the digital marketing world, but not one that satisfies investors for sure. It's probably not surprising, given the absence of strategy to guide the creation of content according to persona and stage in buying journey, that producing engaging content is a top challenge of B2B manufacturing marketers. News alert - if you want to create engaging content it might make sense to do so according to a strategy that considers the real issues and concerns of the folks that would particularly benefit. And then there's budget. Imagine this. These folks who are thrashing about bereft of strategy (OK, let's call it design so it's easier to swallow) are frustrated that they aren't awarded adequate budget by corporate bean counters. One might reasonably conclude that to grant any larger budget would be professionally negligent on behalf of any finance person who did so! Are these marketing folks incompetent? Maybe a couple. But the majority are undertaking a very technical and sophisticated discipline with a traditional marketing approach founded in graphic design and web publishing. There's a reason why some of the most effective folks in the content marketing world are engineers and finance specialists by training. At its core B2B inbound marketing for manufacturers is an extremely analytical pursuit. The good news, though, is that companies open to outside assistance can find some qualified advisors (agencies with a deep experience in B2B companies - rather than marketing to them - are trickier to find.) And they should. Inbound marketing offers awesome (real and measurable) ROI in most cases and most importantly moves the biz dev needle creating a stream of sales qualified leads....if it's done right. Want to learn how internet marketing can help your manufacturing business? Check this out.